My goal is to educate you, stimulate your thinking, and get your Internet marketing in tip-top condition. If your Internet marketing is currently a 3, let’s get it to a 6 or 7. If it’s a 6, let’s get it to a 9 or 10 – in the next 45-90 days! Online reviews can literally make or break a company’s reputation. Of course the best thing to do is to avoid, if at all possible, getting a poor review. But there are some nutty people out there, and getting a poor review can happen to even the best. Long inquiry forms with too many fields usually do not create the most mobile friendly user-experience and may result in fewer inquiries. Blogging has many benefits, but my favorite is that it promotes you as the expert that you are – and that leads to more sales more easily. It also can give your business a solid competitive advantage. Instagram gives you the option of changing a personal account into a business account and it’s a good thing to do for your business Instagram feed. It is still free. Videos undoubtedly get more organic non-paid reach when compared to simpler text with image posts, at both Facebook and Instagram. You’ll get better results and more ENGAGEMENT from your social media posts if you post high-quality helpful wedding planning information. When you do this you automatically become THE EXPERT. It’s important to keep tabs on what your competition is doing. You don’t want to find yourself at a competitive disadvantage six months after the fact. An often overlooked yet powerful way to promote your products and services and drive traffic to your website. Should You Advertise at WeddingWire or The Knot? Studies show that the first company to follow-up on a web -based inquiry has an immediate and significant competitive advantage. Companies that are the first to “help a customer along their buying journey” are 72% more likely to get the sale. (10 of the Most Popular Wedding Hashtags) The right hashtags will make your social posts more “findable” for engaged couples who are searching for content related to those hashtags. Reviews and testimonials are “social proof.” They increase conversion and will help you book more weddings. Here are 10 ways to use reviews and testimonials more effectively. 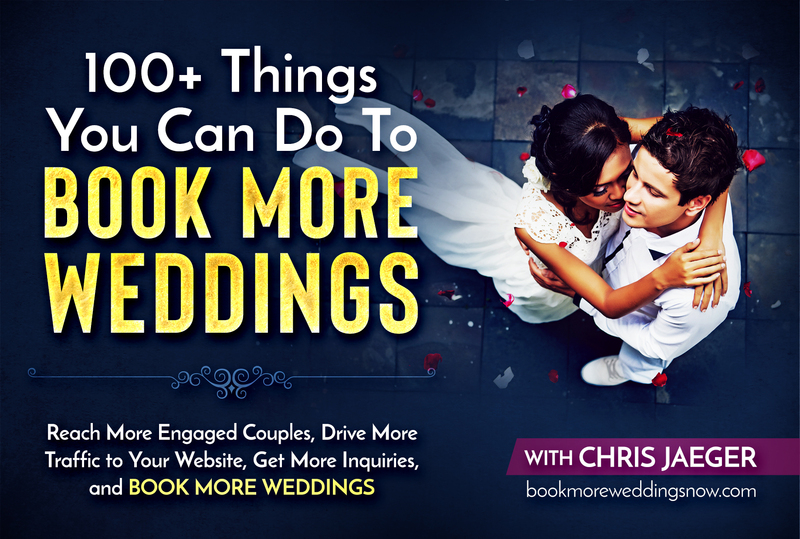 Giving couples the option of text messaging you will help you book more weddings. So many choices and so many shiny objects! The problem quickly becomes that you simply don’t have the resources to chase them all. Nor do you need to. Using the reviews you’ve received at WeddingWire or The Knot at your website and across your social media channels will help you book more weddings more easily! “Dusty” brands are not only at a significant competitive disadvantage, but typically they can’t command premium pricing for their services in any competitive marketplace. Perform a Strengths, Weaknesses, Opportunities, and Threats (SWOT) analysis on your current situation, with a focus on Internet marketing. Brides are planning the most important day of their lives. They want the very best and your website absolutely must make a great first impression. Any weakness here and you are at a competitive disadvantage. If slow loading pages and “bridal bailout” isn’t enough to convince you to choose high-performance website hosting, maybe this will. Google now uses page load times as a ranking factor. Each Fall in Las Vegas thousands of people who work in the wedding industry attend the Wedding MBA at the Las Vegas Convention Center. Effectively using calls-to-action throughout a website has been shown in study after study to improve conversion and increase inquiries. A lot of businesses in the wedding industry get reviews at The Knot or WeddingWire, but what about Google Reviews, the reviews that show up with your Google My Business business listing?